Discussion in 'Special Sessions, Events, and Tour Announcements' started by arthury, Aug 10, 2008. 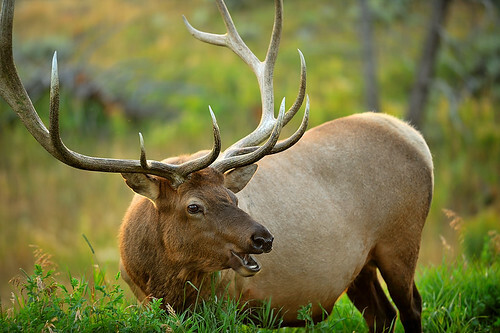 Besides Hayden and Lamar Valley, what other hot spots do you recommend for wildlife and birds photography? BTW, where, specifically, are the good pickings located in Lamar Valley? Any tips will be appreciated. Your question is hard to answer as those valleys are always filled with some wildlife, whether it be bison or other, but in general, if you get off the road and away from people, even a little, you'll see quite a bit. The wolves are out very early and late, and if you find a spot where an elk or something tasty died, you might keep an eye out for them there. That's a very cool map! 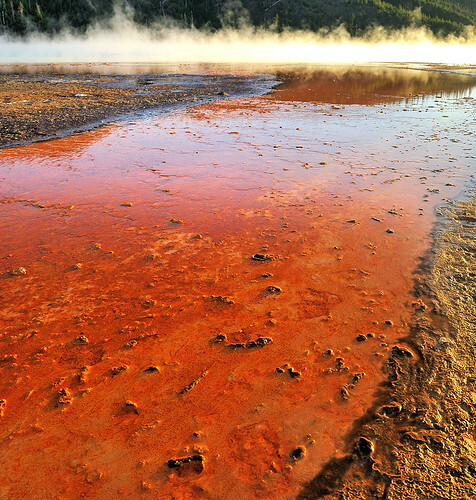 I have been to Yellowstone about 4 times but I was there mainly for landscape work at Teton as well. This time, I want to spend time on wildlife; hopefully, to see the wolves. My understanding is that the wolves are going to be really far away. We are talking 500mm - 1000mm and so even the 600mm lens + TC20 will not be helpful. Is that the case? Awesome resource Sean, going there in October. Will definitely utilize this. Most of the time, they're off in the distance and they're out when it's very dim light, so a long lens with a TC makes for unworkable shutter speeds. When they're on the move and hunting out in the open, they're so fast. In the winter, the larger mammals come down from the higher ground and the wolves are out more during the brighter parts of the day, but travel and access is much more limited with most of the roads closed, so they're always a tough subject. There are a couple of turnouts along the stretch of road right where the Yellowstone Institute camp is at, and early in the morning that's the best spot to be at with a spotting scope to see if you can find any wolves. The paperback book Photographer's Guide to Yellowstone and the Tetons by Joseph K. Lange is well worth it! Thanks, Sean. I would count myself lucky to even see them in this trip. Another good WL spot is the Old Gardner Road, that runs one-way from Mammoth HotSprings to the North entrance, It is a dirt road so it often closes during wet weather. Some of my best Pronghorn shots are from this road, almost always a reliable place for pronghorn. The beginning of the road is tricky to find so ask for help when you are in mammoth. What are the dates that you will be there? That will have some bearing on what wildlife will be where. Another place worth your while would be the Grizzly discovery center in West yellowstone. They have a very good wolf enclosure there with very natural habitat, this can be a good location for close-up wolf shots. The wolf enclosure gets good morning light, so be there when they open. Thanks, Sean Q, I will be sure to check out that road . Just wanted to dedicate a few shots to you all who helped me with the info you supplied. Thanks to all of you who responded; especially, Sean, for that marvelous map! 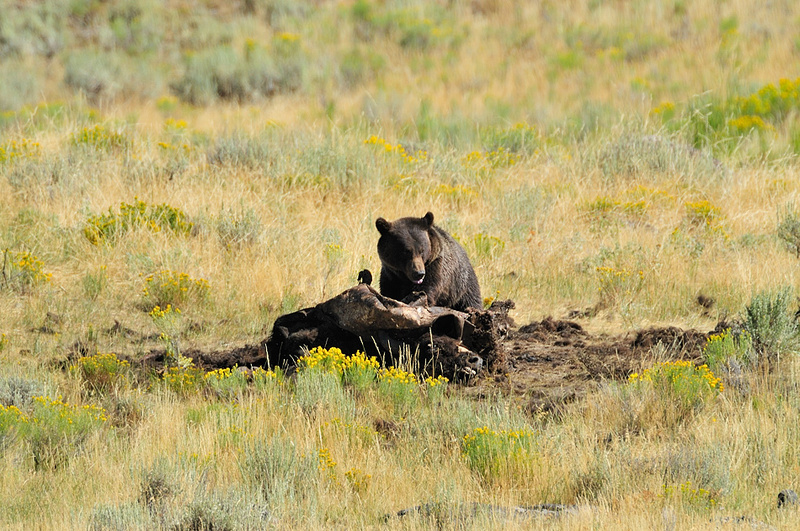 Male Grizzly feasting on a Bison carcass. According to the Ranger's electronic rangefinder, we were about 129 yards. Nice Images!! You were very lucky to get a bear photo, let alone a bear feeding on prey. Great Job!!! Yellowstone is one of my favorite places to visit!